Employee Income of Digital Media & Entertainment Industry Cluster | Propel L.A. 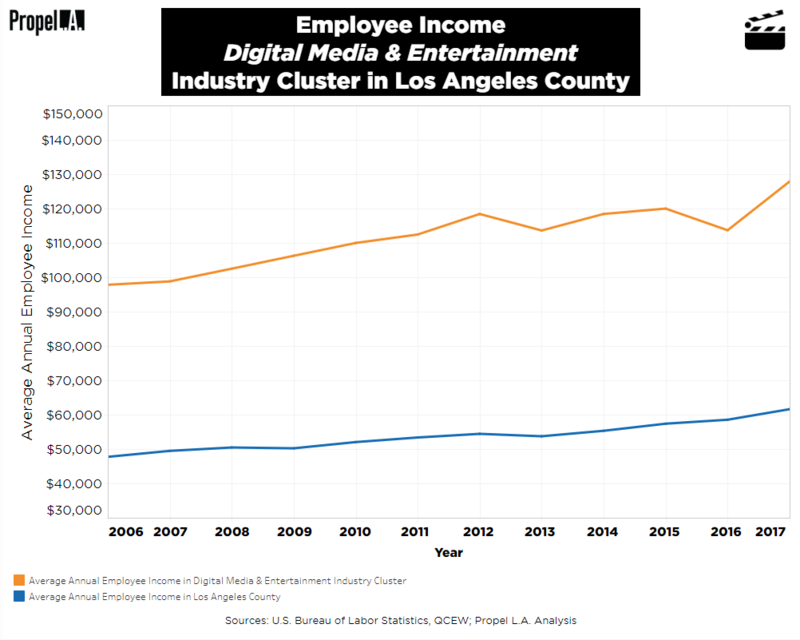 In Los Angeles County, the average worker in the Digital Media & Entertainment industry cluster (“DME”) makes nearly twice as much as the average worker in any occupation. DME industry cluster average wages have experienced some fluctuation since 2011, but the overall trend is still upward. In addition, the DME industry cluster’s average wage of $127,876 in 2017 is more than four times the 2017 living wage of $28,163 needed for a single individual to cover their basic needs in Los Angeles County. What is the Digital Media & Entertainment industry cluster? The DME industry cluster is one of the key traded industry clusters in Los Angeles County, and it is composed of the two separate smaller industry clusters in its name. Motion Picture and Sound Recording Industries (NAICS 512), Broadcasting (except Internet) (NAICS 515), and Performing Arts and Spectator Sports (NAICS 711) exhaustively describe the Entertainment industry cluster (Center for a Competitive Workforce, LAEDC, January 2018). Meanwhile, Propel L.A. selected three NAICS industries through random sampling to represent the emerging Digital Media industry cluster. They are as follows: Wired Telecommunications Carriers (NAICS 517110), Newspaper Publishers (NAICS 511110), and Graphic Design Services (NAICS 541430). To learn more about the state of the DME industry cluster, please click here. Average annual income was calculated in nominal wage by taking the weighted average of all private wages in the selected NAICS industries. NAICS industries were selected by using the definition of the industry cluster in the Entertainment and the Rise of Digital Media in the Los Angeles Basin report (Center for a Competitive Workforce, LAEDC, January 2018). Due to large population size of NAICS industries in the Digital Media side of the DME cluster, Propel L.A. selected three through random sampling to represent this subset of a larger DME population. Note that the summary of results may be slightly biased due to the NAICS industries being nonexhaustive. Lastly, annual living wage is determined by the MIT Living Wage Calculator under the assumption that an individual works full-time at 2,080 hours a year.